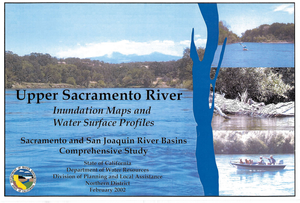 A variety of map atlases have been created for Sacramento River over the last decades. They were produced by State and Federal agencies for environmental planning, assessments, land-use mapping, surveying, public reference, ownership, etc. Much of this need is now met through Geographic Information Systems, which was often used in the production of these atlases. * Note that some of these atlases can be acquired at higher resolution. 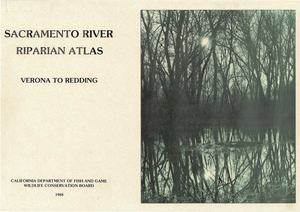 Description: A photographic atlas of the Sacramento River from Redding (River Mile 299) to Sacramento (River Mile 54). A total of 58 black and white aerial photographs, taken in March 1972 at a scale of 1:24,000, are provided. Federal land, State and municipal land, pumping facilities, outfalls, boat ramps, gaging station, historic sites, and river mile are indicated on the plates. 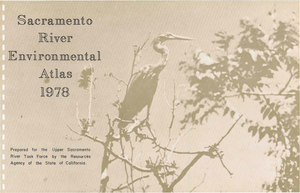 Description: A photographic atlas of 38 sites along the Sacramento River which contain riparian vegetation which was judged to be significant to the overall stability of the river and its overflow areas between Tisdale Weir (River Mile 118.8) and Hamilton City (River Mile 199.4). This atlas consists of 28 aerial photographs at a scale of 1:62,500. 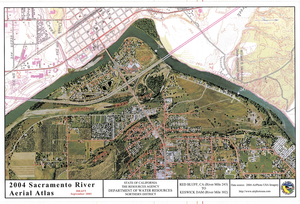 Description: Photo atlas depicting prime agricultural lands, land use, and riparian vegetation along the Sacramento River, Colusa to Keswick Dam to assist in planning for the river's riparian zone. Data elements include land use, navigational hazards, ownership, bank protection areas, gravel operations, gauging stations, spawning areas, and the 1970 flood inundation zone. 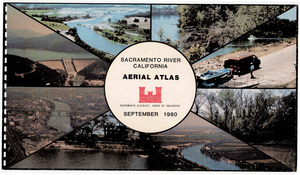 Description: A 1980 aerial atlas covering the Sacramento River from Collinsville to Shasta Dam. The photography was taken on September 29, 1980. River miles, project levees, reclamation district boundaries, levee maintenance district boundaries, county boundaries, gaging stations, geographic names, and hydrological features are included. 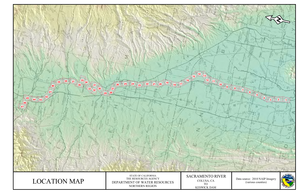 Description: This atlas, in addition to showing the historic channel migration of the Sacramento between the Red Bluff Diversion Dam and Keswick Dam, also provides a baseline description of the physical characteristics of the channel banks and adjacent area. It gives a basis for management decisions regarding the conservation use and enhancement of the upper river and its natural resources. 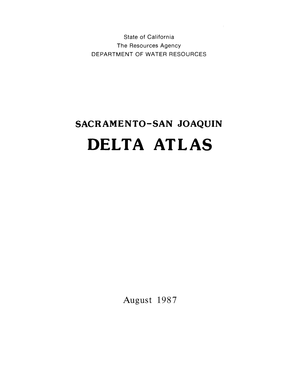 Description: An atlas of the Sacramento River between the City of Colusa and the Red Bluff Diversion Dam, which shows the distribution of spawning areas, gravel sampling sites, bank protection, location of surveyed cross-sections and historic channel meanders. 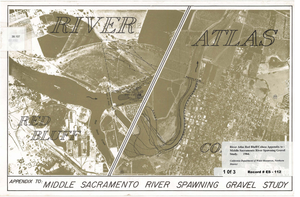 With its companion publication, 'The Middle Sacramento River Spawning Gravel Study' (DWR, 1984), this atlas provides information that will permit evaluation of future changes needed to aid in the development of a management program. 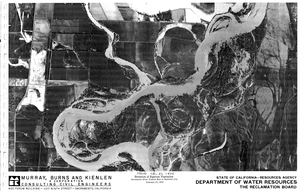 Description: A photographic atlas of the Sacramento River from Shasta Dam to Collinsville (River Mile 0). A total of 40 black and white aerial photographs, taken on May 22 & 29, 1984 are included. Geographic names, political boundaries, major roads, creeks, flood protection structures, revetted banks, gaging stations, and river mile are indicated on the plates. Description: This atlas shows areas of existing levees in delta areas as well as the information concerning these levees. The levees were originally hand dug by Chinese laborers and then eventually made by machines. The creation of these levees was to reclaim the Delta marshland. The Delta has been transformed from a large tidal march to the series of improved channels and levied islands we know today. 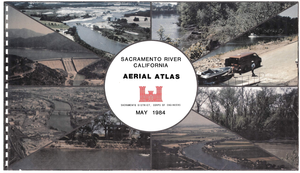 Description: A photographic atlas of the Sacramento River from Collinsville to Shasta Dam. The aerial photography was taken on July 15, 1991. Geographic names, political boundaries, major roads, creeks, flood protection structures, revetted banks, gaging stations, and river mile are indicated on the plates. 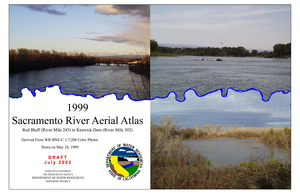 Description: A photographic atlas of the Sacramento River from Red Bluff (River Mile 244) to Colusa (River Mile 144). Color aerial photograph is from May 5, 1997. 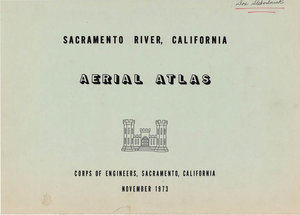 Description: A photographic atlas of the Sacramento River from Red Bluff (River Mile 243) to Keswick Dam (River Mile 302). Color aerial photographs were taken on May 24, 1999 at a scale of 1:7,200. 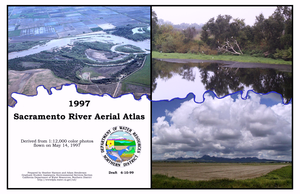 Description: Produced as part of the Sacramento and San Joaquin River Basins Comprehensive Study, this aerial photographic atlas provides maps of the extent of inundation at 50, 100, and 200 year flood events as well as water surface profiles between Vina and Keswick Dam along the upper Sacramento River. 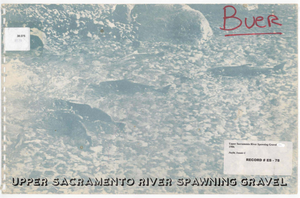 Description: A photographic atlas of the Sacramento River from Colusa (River Mile 144) to Red Bluff (River Mile 243). Color aerial photography is from 2004 2-meter imagery by the National Agriculture Imagery Program (NAIP). 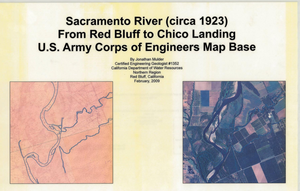 Description: An atlas of mosaiced map sheets derived from the U.S. Army Corps of Engineers mapping program between 1917 and 1923. The atlas contains 18 map sheets. After each successive page of 1923 mapping, the same area is displayed with 2005 National Agricultural Imagery Program (NAIP) imagery. Comparison between these two image sets reveals substantial changes over the the last century, including fragmentation and loss of riparian habitat along the river corridor and tributary streams, changes in crop types and increases agricultural development. 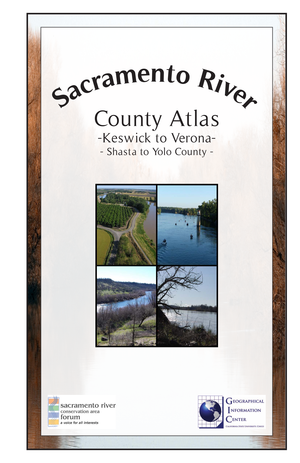 Description: A photographic atlas of the Sacramento River from Colusa (River Mile 144) to Keswick Dam (River Mile 302). The atlas maps depict color aerial photography from 2010 NAIP imagery, and river miles. Each map is at a scale of 1:12,000. 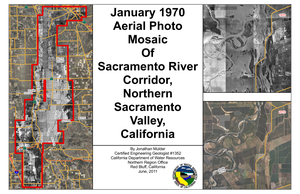 Description: This document contains mosaiced aerial photography from late January, 1970 for the Sacramento River corridor from near Hamilton City downstream to south of Colusa. After each successive page of 1970 imagery, the same area is displayed with 2010 imagery from the National Agricultural Imagery Program (NAIP). 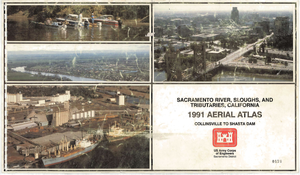 In late January 1970, during a major flood event on the Sacramento River, the Department of Water Resources produced aerial imagery of the flood event on January 24th - 28th. Imagery in the northern portion was taken on January 24th when Sacramento River flows were at or near their peak at the Hamilton City gauge. Imagery further south was taken on January 25th. An intermediate portion of the Butte Basin and a missed area in the north were taken on January 28th. Description: This atlas is composed of 7 maps, one for each county, which depict riparian vegetation, private and public conservation lands, and river miles.